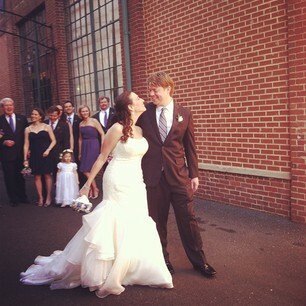 Jackie Fo: Laurie and Matt's Byrons South End Wedding! When people find out that I plan weddings, they always ask me "OMG, do you have any crazy bridezilla stories?" In all honesty I've been really lucky with my brides and they've all been sweet, appreciative and fun to work with. In the case of my most recent couple, Laurie and Matt, they were as nice as could be. I love when I know I've done my job but also made friends. That's uber cheesy, but whatevs. It's true. Full vendor details at the end of the post! They got an absolutely stunningly perfect day in North Carolina. It was the kind of day that you wish for when you're a bride-to-be! 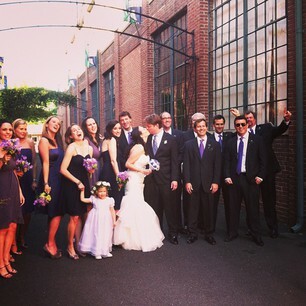 Byron's South End provided the perfect backdrop to the bride and grooms flawless day! 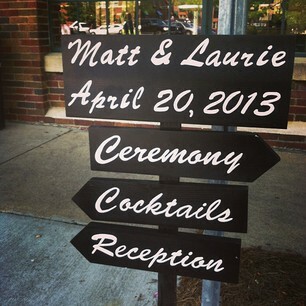 When guests arrived, they were directed where to go by these fun directional signs from Etsy! 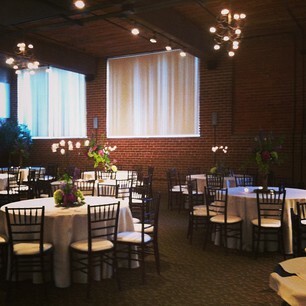 The ceremony was held at the Atrium, which is also part of Byron's South End. There was a beautiful arch made from branches and rustic flowers and the same design was lining the aisle. After the bride and groom were pronounced man and wife (yay!) the family and wedding party stayed for pictures. Here's the happy group! LOVE this photo .... and her dress' asymmetrical-ness. Speaking of her bridal look - how amazing is this brooch bouquet? This brooch was made on Etsy but a few family brooches were incorporated as well. Note - this bouquet was heavy! Laurie was a trooper to carry this all day! While the wedding party was taking photos, the other guests were enjoying a fantastic cocktail hour in the courtyard. I absolutely loved these dark blue linens on the cocktail table and the unusual flower vessel. 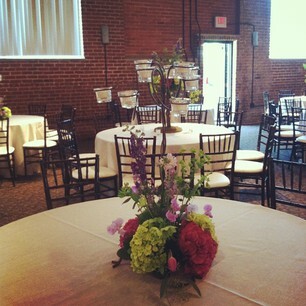 Inside the reception room were beautiful florals, mahogany chivari chairs and ivory linens. 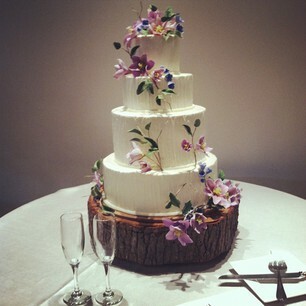 The cake was absolutely gorgeous (and delicious) I might add. Laurie and Matt had a real connection the cake baker - Matt's sister is Haines Barksdale from For Goodness Cakes! For Goodness Cakes makes gorgeous wedding cakes for tons of Charlotte brides and she's super talented (not to mention super sweet as well). To represent Laurie and Matt's love for chocolate, we had a chocolate bar set up with dark and milk chocolate, white chocolate almond bark, chocolate covered gummy bears and raisins... this was SUCH a hit! I must have refilled the chocolate bar a gazillion times. 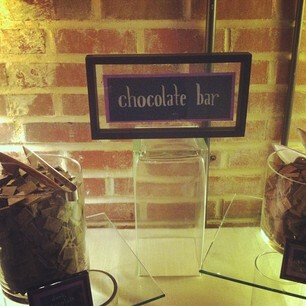 People went crazy over this chocolate - I loved it! The guest book was simply a "P" letter that guests could sign to represent the couples new last name. So creative! The happy bride and groom ran through a sea of glo-sticks at the end of the night! The second photographer of the night, Tonya with Poprock Photography, who I've known for awhile, sent me this fun picture of the cute cake forks. Maybe it was because I nicely forced her to take a photo of them? Ha. When I get my hands on the real photos, I'll be sure to do a separate post. In the meantime, I wish Laurie and Matt all the happinness in the world!